I recently created “song stones” as a way to help cue my clients during songwriting interventions. By choosing stones that provide a sensory point for the client in addition to the cognitive word cues, clients are easily led to discussion and creation of lyrics. I used Mod Podge (official name of the product that can be purchased at craft stores) to seal the words onto the stones and keep them out on a table in the therapy room for when I need them. (I kept them in a bag for a while but they got sticky and I had to re paint some so I’d advise keeping them dry and on a table or shelf – keep away from angry clients or little clients who like to throw rocks ). I place them on a table and have the client choose two or three that catch their eye or spark a thought. Sometimes I just have them choose one. Exercise your best therapeutic judgement in creating catchy hooks and phrases when you are using songwriting to help a client express their feelings. In cases of trauma and abuse, if the client is ruminating on a troubling situation or trauma memory and the hooks or lyrics keep the client stuck in that negative emotional place then the intervention may be contraindicated unless you modify it. You never want to train a client to memorize a negative thought. It’s good to express it but also as important to focus on healing and hope. Many ways to modify. One suggestion, to modify it: Guide the client to a “way out” musically and lyrically using the power of the music tools of melody, harmony, lyrics and hooks. If the client does insist on the negative hooks and lyrics, suggest that they create a “counter” to that song by re-framing it into a positive song with memorable and positive hooks and lyrics. Also, make room for verbal processing of the material created. As an MT, utilize your skills, training and remember to “do no harm”. 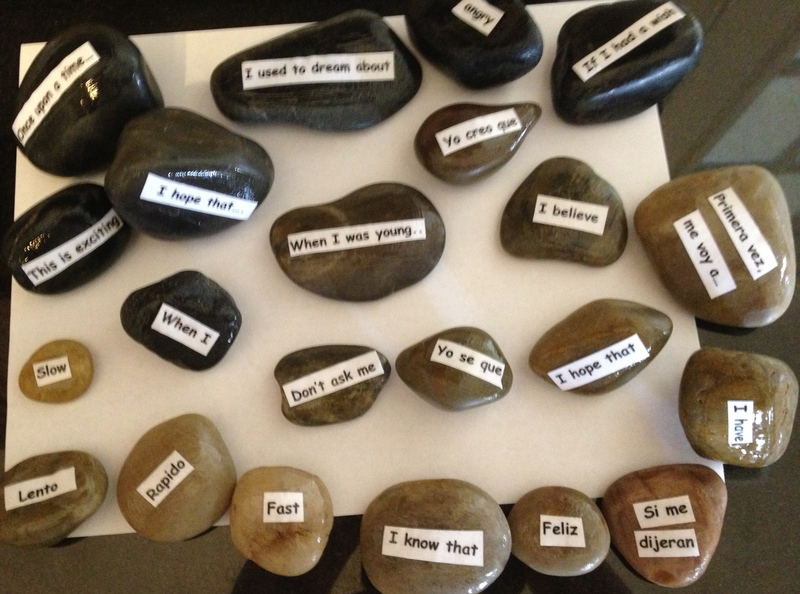 The use of the song stones is helpful when a client has a hard time coming up with ways to create lyrics to their own songs. Why would a client need to write a song? This entry was posted in Intervention Ideas and tagged cues, lyrics, MT, sensory, songwriting on June 19, 2013 by taniacordobes.